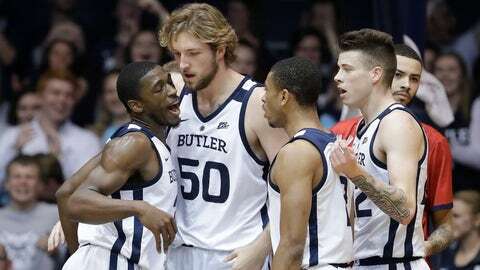 Kamar Baldwin (far left) had 26 points in Butler's win over Detroit Mercy on Monday night. INDIANAPOLIS — Kamar Baldwin scored 13 of his 26 points down the stretch as Butler pulled away for an 84-63 win over Detroit Mercy on Monday night. Baldwin hit a 3-pointer nearly two minutes in that made it 3-2 and Butler led the rest of the way. McFolley scored the first five points and Davis the last 13 — including three threes in an 81-second span — during an 18-4 run to open the second half that pulled the Titans within four, but the Bulldogs answered with nine consecutive points and later used a 21-5 run to make it 84-59 with 1:45 to play. Butler shot 52 percent from the field and made 19 of 23 free throws.